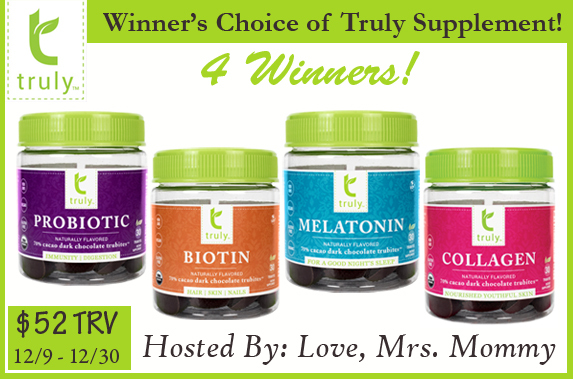 Love, Mrs. Mommy: Winner's Choice of Truly Supplement Giveaway! 4 Winners! $52 TRV! Winner's Choice of Truly Supplement Giveaway! 4 Winners! $52 TRV! A 30-Day Supply of Their Choice of Supplement! Choose between: Biotin, Melatonin, Collagen, and Probiotic! Truly supplements are a brand new line of chocolate supplements! Yes, I said chocolate, YUM! Now you know why I said you won’t have an issue remembering to take them! They are called trubites, and they are a delectable alternative to caplets, pills and gummies. Their proprietary formula consist of 70% dark chocolate and are made with the finest organic cacao nibs, cane sugar and cocoa butter. All supplements are vegan, organic, gluten and dairy free, and contain no additives or GMO’s! Which is just another reason to love them even more! It’s no wonder the trubites are in the shape of a heart! Disclosure: Love, Mrs. Mommy and all participating bloggers are not held responsible for sponsors who do not fulfill their prize obligations. Love, Mrs. Mommy received Truly supplements at no cost to facilitate the above-mentioned review. This giveaway is in no way endorsed or sponsored by Facebook or any other social media site. The winner will be randomly drawn by Giveaway Tools and will be notified by email. Winner has 48 hours to reply before a replacement winner will be drawn. If you would like to participate in an event like this please contact LoveMrsMommy (at) gmail (dot) com. Thanks for offering this giveaway! I could totally use this. However, you can only go to certain doctors and hospitals for your care. Check with your individual state insurance department to find out if Medicare SELECT plans are available in your state.